This book came home with me from work at least 3 times before I actually cracked a page open. When I finally managed to make the committment, I wanted to punch myself for not reading it earlier, it was that good. 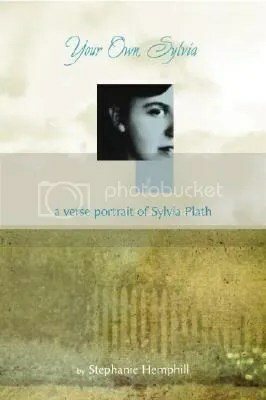 Stephanie Hemphill has taken probably every known fact about the life of Sylvia Plath and put it into this book. It is not a novel-in-verse, neccessarily, as each poem is its own unit and has its own context, but the journey is linear. The book begins with Sylvia’s birth and ends with her death, citing after every poem, the sources from which she drew her material. And one mustn’t forget that Sylvia was not just a lady with a provacative life story – an abusive father, earning various academic awards and acheivements, marrying a famous poet and ending her own life at a young age. Sylvia was a poet. And each of Stephanie’s poems are based topically and structurally around a certain poem by Plath herself. It made me want to reread The Bell Jar, and pick up a collection of her poetry as well. And maybe Ted Hughes’s work too. I love a book that makes me want to get up and read more. Buy this for: High school students who carry The Bell Jar around like a status symbol (oh, these girls are out there, and this collection is markedly less morose than Plath’s novel), biography enthusiasts who would be open to a new form for their favorite genre. Would pair well with her autobiographical novel or a poetry collection, or maybe the movie Sylvia, although I haven’t watched it yet. Maybe even throw in Mrs. Dalloway for your favorite feminist!